There was supposed to be a track meet at the Fargodome in Fargo ND last weekend – the North Dakota Class A and Class B state championships, as a matter of fact. But while you may have seen plenty of student-athletes in the facility during the days leading up to that scheduled event, working hard as hard as they ever have, they weren’t racing, jumping or throwing. In fact, tracksters at Fargo area schools haven’t been racing, jumping or throwing anywhere. They haven’t even been in school. That’s because Fargo and surrounding communities spent last week drowning or in danger of drowning from the relentlessly rising Red River. Given the history of floods in this tabletop-flat area, residents always have to be aware of the sleeping giant that snakes through its midst, but this was unprecedented. It snowed and snowed all winter, then rained, then snowed again, then melted, then rained and snowed again. It all had to go somewhere and the river swelled 24 feet beyond its flood stage, finally cresting Saturday in Fargo at 40.82 feet, past all previous records. So if you were willing, you sandbagged. 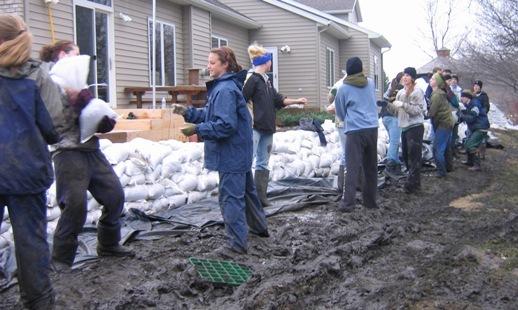 And when you ran out of sandbags, you went back to Sandbag Central, a.k.a. the Fargodome, and got some more. Enough sand probably moved through the facility to fill every long jump pit in the country. It’s been a nightmare for everyone, but when you’re a spring sports athlete, like the tracksters at the area schools, there’s a sense of your season slipping away from you. It’s obviously difficult, between the flood and the snow and school being closed for two weeks, to get any kind of training in. Fortunately – if such a word can be used to describe any aspect of the situation – the first outdoor meets aren’t until mid-April, so none of those have been lost yet. Some of the student-athletes most affected have been at Fargo South, which is one of the powerhouses in the state and home to the nation’s fastest girls’ 800-meter runner in Laura Roesler. Indeed, it was not just Storm, but nearly all of her teammates that were part of thousands of volunteers trying to build dikes and literally save the community. Coach Svaleson marveled at her team’s commitment to getting the job done. “We spent a great deal of time at a house on a bend in the river building a five-foot dike. Ultimately, the family was airlifted out in a basket by the Coast Guard and eventually lost their home. However ,the dike we built held strong. The ladies were upset when I relayed the info about the family, but felt such an incredible sense of pride that what they did mattered. 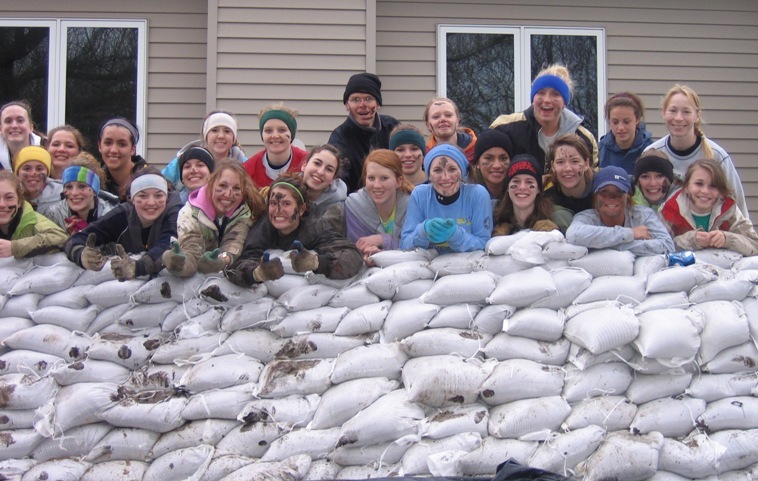 Of course, the girls at Fargo South were part of legions of volunteers of every age and background, including other student-athletes in the area. “We were in awe of the many people helping out with the effort, from the 6-year-old little boy opening bags to the cute little ladies pulling sleds down the street full of warm treats and hot tomato soup and hot chocolate and sandwiches,” said Svaleson. 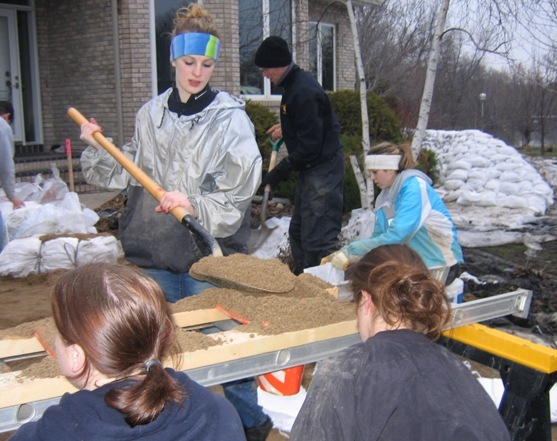 “Everyone pitched in to do their part and felt helpless once they called off the sandbagging efforts. Sheer exhaustion accompanied by sheer determination gets you through the days. One of those was Bismarck head coach Dave Zittleman. But Bismarck, situated on the Missouri River, had its own flooding to be concerned with, too. “We had some flooding in southern Bismarck/Mandan and it has affected many people, but most of the water has started to go down,” Zittleman said. 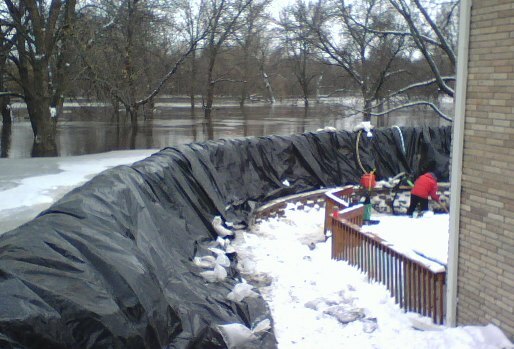 “We had a huge ice jam on the north and south sides of Bismarck that was causing most of the problems … but they were able to blow up some of the ice jam to get the water moving downstream. The river crested over the weekend and, with just a few exceptions, the dikes held. In the days since, the river has fallen, getting down to 37 feet by Wednesday – still well above flood stage, but below the floodwalls and the dikes. But North Dakota is not out of the woods yet and still at the mercy of Mother Nature. A blizzard hit early this week, dumping more than a foot of snow in many areas. The storm made the follow-up work on the flood tough, and also raised worries of a second crest of the river days or a few weeks down the road. For now, the communities are working toward getting at least some aspects of life back to normal – though Fargo schools won’t open until Monday. Svaleson said her team was able to joke while filling and flinging bags about “how great their arms will look in their uniforms. “Thus far, our team has maintained a mature outlook on the situation, they understand this experience is much more than just a track season, this is real life,” she added. “Life will go on, we will recover, and we will all be stronger not just as individuals but as a community because of it. Storm and her teammates lamented the lost competitive opportunities, but were taking the most positive approach possible. “We haven’t had any meets yet and we were really looking forward to indoor state. We’re a really close-knit team and we train together all year, so it’s tough to lose a meet like this.